How do you remember the dead in the aftermath of a war? Collect money for a memorial, what then? £4,000 to purchase Lower Higham Farm to be used for public recreation. A small sum was also set aside to pay for a civic wreath to be placed on the memorial on "Peace Day" each year and to maintain the cenotaph in good condition. There was a debate about where the cenotaph should be located. Some suggested the Market Place in Hyde town centre, but a majority voted for a prominent position on a hill overlooking the town. The place, known as Hackingknife, can be seen from most parts of town, and was within the area proposed for public recreation. The cenotaph, a 27 foot high column of Cornish granite standing on a base surrounded by iron railings, was unveiled at a ceremony on 25th June 1921. It's main inscription reads "IN HONOUR OF THE 710 MEN OF HYDE WHO GAVE THEIR LIVES FOR KING AND COUNTRY". It bears no names, they were already recorded on the Memorial Panels in Hyde Town Hall. The cenotaph still overlooks the town. Ceremonies are held there each year on the Sunday nearest Peace Day, and on Remembrance Sunday. The Armistice (a truce) signalled the end of fighting in the First World War. It occurred at 11am (Paris Time) on the 11th November 1918. Armistice Day is the anniversary of that day. In the UK most commemorative ceremonies are now held on the Sunday nearest Armistice Day. In Hyde a ceremony is held at the Cenotaph on Werneth Low, usually at 12 noon. The Armistice stopped the killing, but the war didn't officially end until a peace treaty had been negotiated and signed. The main peace treaty, the Treaty of Versailles, was signed on 28th June 1919. Peace Day is the anniversary of that day. In Hyde a ceremony is held at the Cenotaph on Werneth Low on the Sunday nearest Peace Day, usually at 3 p.m. The inscription on the Cenotaph shows the official end of the war: 1919. Note: Peace Day should not be confused with the United Nations International Day of Peace (21st September). The fallen men had left 268 sons and daughters. £3,750 was put into a Trust Fund to pay for their education. The Trust decided to pay £4 per annum towards school fees for each child between the ages of 12 and 16. That amount was calculated as follows. The fees for Hyde County School were £7 per annum, but the local Education Board already provided £3 to those who were unable to find the full fee. The Trust Fund's grant thus made up the full cost of school fees. The first distribution was made on 1st October 1920. Not every orphan was able to take advantage of the offer of education until 16. The official school-leaving age at that time was 14, having been raised from 10 in 1918. For many the pressure to start earning a living was too great. 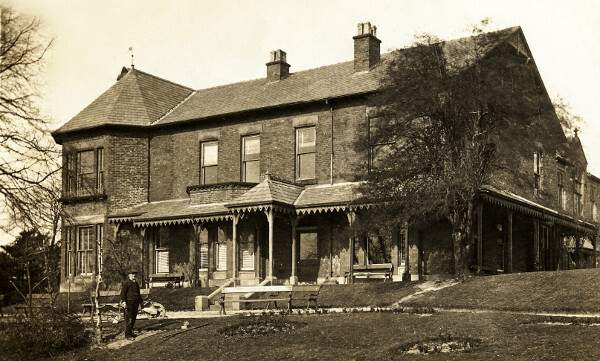 Werneth Lodge, on the slopes of Werneth Low, had been given to the Borough of Hyde to be used for maternity and child welfare purposes following the death of it's owner, Arthur Palmer ASPLAND. The aim was to enable women to give birth away from their often overcrowded and sometimes insanitary homes, as well as to give them better access to medical facilities. The Ministry of Health offered to pay half the cost of converting Werneth Lodge into a maternity home, the war memorial fund gave the rest, plus money to buy the chief rent. Various difficulties arose which delayed the conversion. It was 1st October 1931 before it opened to the public. Despite the long time that had elapsed, it was formally opened by Mr Aspland's widow and named the Aspland Maternity Home. Two generations of Hyde's children were born there. In 1947 it became part of the National Health Service. In the 1970s maternity facilities were centralised into a new purpose built hospital and after a brief spell as a nurse training centre Werneth Lodge was declared redundant by the NHS. There was an unsuccessful fight to preserve its three acres of gardens for use by the public, but in the 1980s the Lodge was demolished and private houses were built on the land. At first sight it may appear strange to include space for public recreation when creating a war memorial, but there is some history to the choice, and this part of the war memorial has been a good benefit for Hydonians. Werneth Low (the word "Low" is thought to come from the Anglo-Saxon word "hlãw" meaning a hill) is a hill standing slightly apart from the rest of the Pennines, and overlooking the Cheshire Plain. From the top, there are good views over the town of Hyde, over Cheshire, Lancashire, and the whole Manchester area, and over parts of Derbyshire, and Yorkshire. The Romans built a road across the Low, and the Victorians built a racecourse on it. It's land is not particularly productive. It stands about 900 feet above sea level (500 feet above the town) and is in an exposed position. On a bad day you would not want to be up there without some very warm clothing, but on a good day it can be very pleasant. By the early 20th century the town below was polluted by the smoke and haze of industry. Mill workers enjoyed the fresh, less polluted, air on top of the hill and used it for recreation when time allowed. Many a lad in the trenches dreamed of home, and those from Hyde usually had happy memories of Sundays spent playing on the Low. For some years the Borough council had been paying £20 per annum to the landowners to encourage them to allow free access, but the landowners were hardening their position, perhaps due to the increasing number of visitors. There was a possibility that most of the Low would soon become inaccessible to the townsfolk. This was a skirmish in the fight that would culminate twelve years later in the Mass Trespass on Kinder Scout, seven miles to the south-east. The War Memorial Committee were able to resolve this particular skirmish by buying Lower Higham Farm and putting it in trust for the people of Hyde. This provided a good location for the cenotaph, and ensured that Hydonians would have permanent access to part of the Low. For the next fifty years the farm was rented to a farmer, and used for the production of milk. The cows and walkers co-existed. 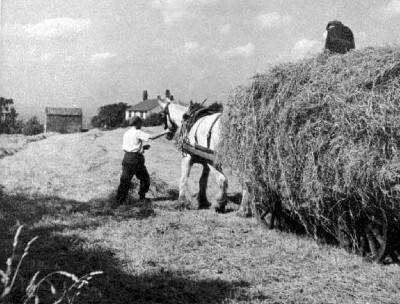 Haymaking at Lower Higham in the 1950s. In 1974 a re-organisation of local government abolished the Borough of Hyde. County boundary changes moved the town of Hyde out of the County of Cheshire and into the new County of Greater Manchester. The town became part of the new, much larger, Metropolitan Borough of Tameside, named after the River Tame which flows through it. The new Council took a fresh look at the War Memorial Trust area on Werneth Low and decided to promote its development into a Country Park. Werneth Low Country Park was formally opened to the public on 9th of June 1980. The Park is run jointly by Hyde War Memorial Trust which owns most of the land and Tameside Metropolitan Borough which provides many of the facilities.